That bit last week about having some sort of idea as to what my Olympic Knitting might be, well, lets just forget that bit, shall we? I have ruled out Helga for now, for financial reasons. I already have a plane ticket to Maryland. I would like to buy some yarn while I’m there. Therefore, I am trying to avoid buying yarn between now and then. Oh, and it probably has a bit to do with Anne Marie’s reminder that I do indeed live in Houston. A wool sweater in Houston might not be my brightest idea. This weekend, I did a little stash shopping. I found some Cotton Ease in pink and black. I know that Cotton Ease might not be the best Fair Isle choice, due to wool sticking together or some such thing, but Cotton Ease is what I have. And, I found a sweater pattern that I like with portions of fair isle, Alice. I will admit that I am still waffling. There are so many projects and so many cool challenge ideas that I will likely not commit until a day or two before the Opening Ceremonies. But, I got gauge and began to learn a thing or two about Fair Isle knitting, like which yarn to hold in which hand. You can see this in that the black shows up better toward the bottom of the above picture than the top due to a yarn-holding-switch halfway through. So, for today, my Olympic Knitting is Alice. I’ll keep you posted on the status of my ever-changing mind. YAY YAY YAY! I will look forward to giving you a BIG HUG at MSW 2006!!! ’twill be a BLAST! So glad you are coming! Yes we must save to buy yarn at MD!! Changing our mind, it’s what we women are good at! Be true to your inner self, don’t choose until the last minute!! Makes for lots of stress. 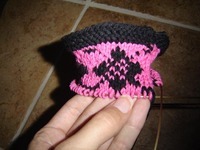 I love the pick and black together…it’s very pucnk rock fair isle, oh yeah. Kate is right, I pooped on your wool party. But if you knit it, you could wear it to MS$W. What was I thinking?